Record temperature and humidity with this microprocessor-based recorder with remote sensing capabilities and user selectability of both temperature ranges and recording times. The user sets all recording parameters using a keypad and dip switches. 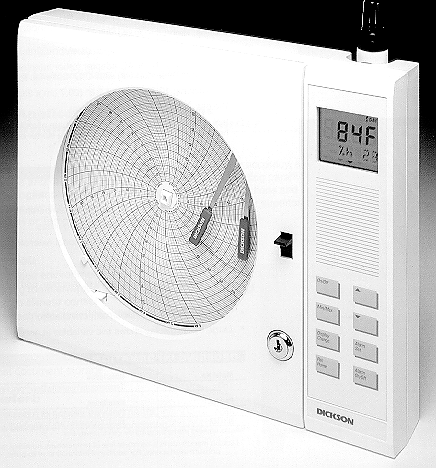 The THDx has an 8" chart for superior resolution and a digital display for temperature and humidity readings at a glance. °C/°F switchable. Min/Max feature. Remote sensing with extension cables. Recording times: 1, 7, and 31 day. Alarms: High/Low, Audio/Visual. Power supply: 120V DC, 120V AC adapter is supplied with the unit. Back up power is supplied with 4 "D" batteries. The dimensions of this unit are: 10.5" tall, 13.2" wide and 2.8" in thickness.